Pushkin's House the centre for Russian Culture in London. A town house with a grand entrance. My posts may be a little erratic over the next week as I am travelling and finding internet connection a bit of a problem. 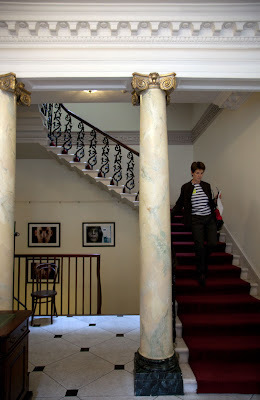 Loving the marble pillars and that deep red carpet! Pushkin doesn't look as old as I expected. Nice stairway mind.